Every football game, regardless of the level is littered with mistakes, most of which are harmless and hardly noticed. Where an error is made by a defender, especially the goalkeeper, that error is often costly. It doesn’t matter how well a player might have performed all game, it will be that one bad mistake which will be remembered and highlighted. But what about mistakes made at the other end of the field? How often does a manager bemoan his team’s failure to put away chances after dominating a game, with points lost because of poor actions and bad mistakes in attack? SportsMatrix decided to investigate this issue, examining mistakes made by attackers on a league basis and at club level in Europe’s top five leagues after the opening games of the 2016/17 season. Before examining the data, it is necessary to clarify what is meant as an attacking error. An attacking error will either be an error resulting from poor decision making during an attacking move or a poor technical action performed by a player in an advanced attacking position. Examples of a bad decision might be shooting on goal from a difficult angle, when a teammate is clearly better positioned or playing a pass to a teammate clearly in an offside position. A poor technical action is where an attacking move breaks down as a result of poor attacking play, such as a poor pass, a bad shot, perhaps a poor dribble or a poor first touch. Some attacking errors are more important than others, so we subdivided them into Attacking Errors in a Chance Situation – a mistake made when the attacking team reaches a goal scoring situation and Attacking Errors in Goal Attempts, which might be a poor attempt on goal, or a player completely missing the ball when attempting to shoot or head the ball. In the first table we examined the average number of attacking errors per team per game on a league basis in Europe’s top five leagues and the percentage of attacking errors per team per game from a goal scoring situation. After the opening games of the new season it appears that whilst teams from the Italy’s Serie A were guilty of committing most attacking errors per game, they were less likely to make errors once reaching goal scoring situations, with the lowest percentage of attacking errors from goal scoring situations and slightly better than teams from Spain’s La Liga. Whilst the other four European leagues averaged a similar number of attacking errors per game, teams from Germany’s Bundesliga were guilty of committing the highest percentage of attacking errors once they reached chances. The top and bottom 10 teams to commit attacking errors. The top and bottom 10 teams to commit attacking errors per game in goal attempt situations. The top and bottom 10 teams in percentage of attacking errors per game in chance situations. Five of the 10 teams to commit most attacking errors came from Italy’s Serie A. 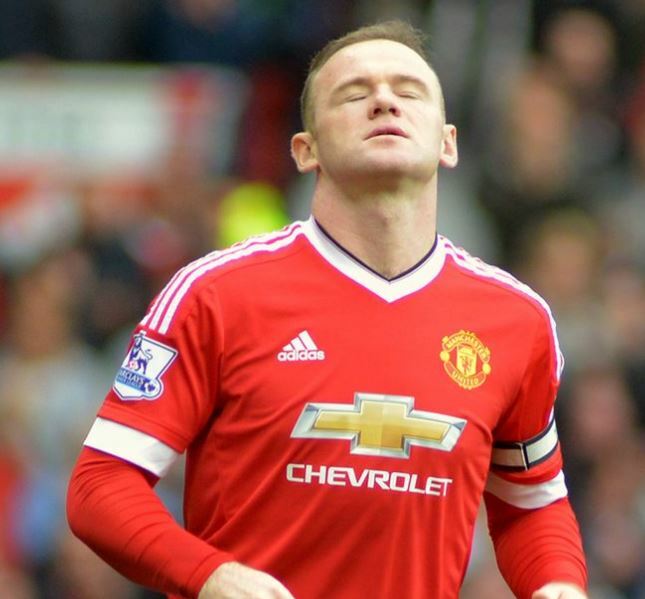 Six of the 10 teams can be regarded as potential contenders to win their respective leagues. 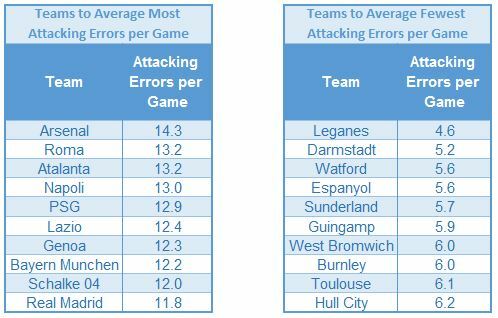 Of the teams to average fewest attacking errors per game, five are from the Premier League. The team averaging fewest attacking errors per game were newly promoted Leganes from La Liga. Almost all of the teams in this group can be regarded as likely to finish in the middle or lower half of their respective leagues. Three of the top four clubs guilty of most attacking errors from goal scoring attempts came from Serie A, with Atalanta, Lazio and Genoa also featuring in the top 10 for most attacking errors per game. Schalke, bottom of Bundesliga after five defeats, appeared amongst the teams to feature in averaging most attacking errors per game; but are also in the bottom 10 teams for the fewest attacking errors made when reaching an attempt on goal. Premier League clubs Hull City and Burnley averaged amongst the fewest attacking errors per game and amongst the fewest attacking errors in goal scoring situations. 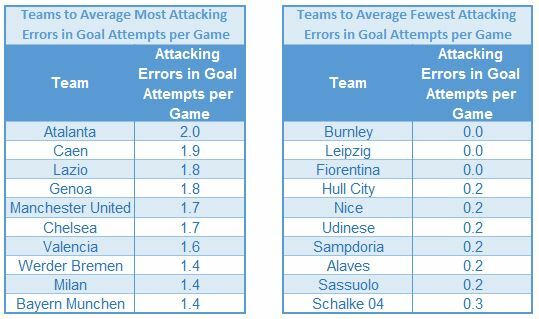 Burnley, with Fiorentina and RB Leipzig are the only teams not to commit an attacking error when attempting a shot or header on goal. Although averaging more than five chances per game, Burnley are yet to make an attacking error in a chance situation. RB Leipzig reached twice as many chance situations per game as Burnley, committing a very low percentage of bad actions once they reached a chance. 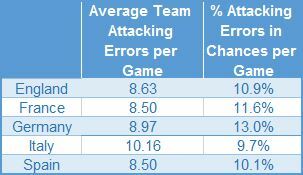 Four of the 10 teams to commit a low percentage of attacking errors in chance situations came from Serie A. With between a quarter and a third of all of their chances ending in a mistake, Augsburg, were one of four Bundesliga teams to feature amongst the team with a highest percentage of attacking errors from chance situations. 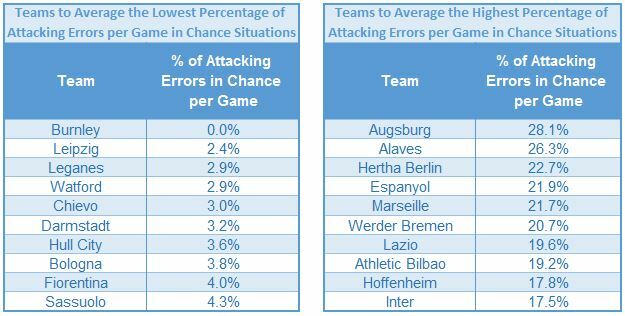 Deportivo Alavés from Spain were only slightly less prone to attacking mistakes from chance situations than Augsburg; whilst no English Premier League side featured in this list.